On the shelves in my study there are long rows of small, hard-backed notebooks. Most of them are blue or black, with a red fabric spine. On the spine there are usually some dates, and often some place names: Beirut: 8-9/1993; Danakil: 4/2002; Misc North Africa 4-6/2007; Spitsbergen and North Pole: 2004; Peloponnese, 9/1997. Occasionally there are some subjects: Swifts; Wolf-cults; Being an Animal; Intuitions; and, mysteriously, not to say pretentiously, ‘Notes from a Yorkshire Sinai’. When I take a notebook down, blow off the dust, and open it, things fall out; a receipt for dinner for two in Cairo (who was she? And how on earth did I afford that as an undergraduate? ); a faded blue flower from a radioactive mountain in Kyrgyzstan; grains of sand from Wadi Rum; part of a menu from Kashgar; a butterfly wing from the highlands of West Papua; a bus ticket from Van to Ankara. At the back of each notebook there are scribbles, often in another hand; the dose of tinadazole for the giardia I got in the Kumaon hills; the address, in a grim Almaty tower block, of Olga, who always (says my annotation), wore beaver-skin boots; the date when the first swallows gust over the Straits of Gibraltar; the time of the late, slow train from Madras to Trichi; the name of a man in Andritsaina who puts out a dog bowl of wine for Dionysus every night. But nothing falls out of recent notebooks. There are no recent notebooks. I’ve been away a lot, and I’ve written. But I’ve seen the business of writing as the business of fitting what I see into a – and increasingly the scheme. So I’ve sat at café tables in Reykjavik, Delhi, Brisbane and Addis Ababa looking around me and gathering only what is necessary to support The Thesis. There are many things wrong with this. It is, for a start, very boring. It denotes that I’m not, as Michael Sandel would put it, open to the unbidden. And that, for him, means that I’m dead; or at least not thriving in the way that properly living people thrive. While I’m on about thriving, notebooklessness is Manichaeism, and Manicheans are in a very bad way indeed. To sit there at a table, looking at solid, pulsing, reeking, embodied things and to think that the important thing about them is the way they can be distilled into abstractions or compressed into a pre-synthesised structure is to deny the significance of their and my embodiment, and ultimately to break the connection between my body and my environment, seeing as valuable only the incorporeal things. Ascetics, and their siblings, the Neo-Platonic philosophers, have lost the plot of the human story. This happens, too, as a consequence of the self-referential (and self-reverential) business of thinking that my scheme deserves to be supported rather than challenged. For the ‘I’ that has constructed it isn’t the ‘I’ that suffers, urinates and feeds. It’s the ‘I’ that thinks. Divorce cognition from feeding and excretion and you have madness, boredom, monasticism and intellectual masturbation. It’s also politically offensive. To be that way is simple, corrosive colonialism. It’s not offensive because it’s colonialism: colonialism is offensive because it’s like that. It’s the attitude that says: ‘I’ve got it right: I will take from these places the things that help to fill the coffers.’ That I’m exporting ideas, smells and scraps of conversation rather than gold or coal doesn’t make it any better. I’m a strutting, chinless, swagger-stick-brandishing Raj-puppet, or an Exxon executive. And all because I don’t keep notebooks. Of course you can sit in Benin writing The Thesis with a sweaty fountain pen in a Moleskine notebook. That would be simply a more efficient form of self-worship than mine – which involves sitting somewhere exotic and drafting abstractions in my head which I then type into a Mac in an Oxford library. But, as I think Chatwin knew, the notebook-on-the-spot ritual makes it rather harder. A man with his head connected to waitresses, trees, toilet-stench and flapping fruit bats via his hand and a locally-stained notebook (ideally bristling with old bus tickets and pocked with squashed mosquitoes) is safer from The Thesis than he would otherwise be. He’ll acknowledge, at the very least, that what he puts down on the paper is dependent on the whim of the waitress in not kicking him out, and on the whim of his bowels in not making him squat in that horrific toilet. These are, for any reasonably sensitive person, salutary reminders of the wider, deeper, more general dependence, the acknowledgment of which is the main qualification for being a human being and being a writer. Notebooks aren’t great prophylaxis against infection with narcissistic abstraction, but the stakes are so high that any degree of protection is worth having. I’m writing this in a tiny, remote moorland cottage on Exmoor. I have to work on the kitchen table. Just about everything else we do has to be done there too. The children surge all around me. I never get more than two minutes of uninterrupted writing. No doubt it shows. ‘I want some peanut butter’. ‘Rachel just bit me’. ‘What happens if you see a frog?’ ‘Johnny’s just fallen downstairs’. But, though I’m typing straight onto the Mac, the happy chaos does for me what notebooks, at their best, can do. I’m almost brutally embodied; super-saturated with relationality; constantly and nerve-wrackingly aware of how contingent my happiness is. If Johnny fell just a bit more awkwardly, it would be over. I’m sure that this does terrible things to my style, but at least it’s impossible to write The Thesis while I look past the screen onto the yellow and white flowery tablecloth, damp with this morning’s cereal spillages. And may God, if she exists, keep us from The Thesis. The next trip is to one of India’s dodgy edges. I can’t take the children or that horrible tablecloth. 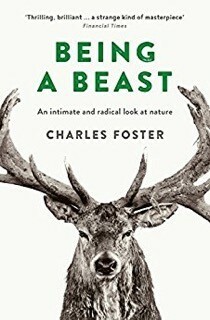 But I can take what they’ve taught me: the acknowledgment that Charles Foster is a creature of his relationships: that it is impossible to describe me without describing the nexus of relationships in which I exist and of which I consist: that any writing voice I have is the voice of that nexus; that I’m a be-bowelled body as well as a brain and a soul; that otherness is a prerequisite of relationship, and that nothing that is not acknowledged as other can be understood or described. But I can take something that helps me to forge a relationship between the embodied Charles Foster and the embodied, independent-of-me Indian frontier. 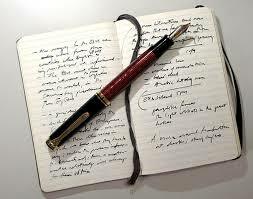 I can take a notebook whose pages will get soggy in the monsoon, faded in the sun, and stained with ghee. And I can take a pen which, directed by my hand (which itself will be burned with the sun and perhaps strained from slinging my rucksack into the belly of buses) will slalom round the stains and write something that denotes the relationship between the frontier and the net of relationships that I call me – all of which is long-hand for my description of the frontier. With a lot of concentration I might be able to keep some of it free of The Thesis.